Day Four. 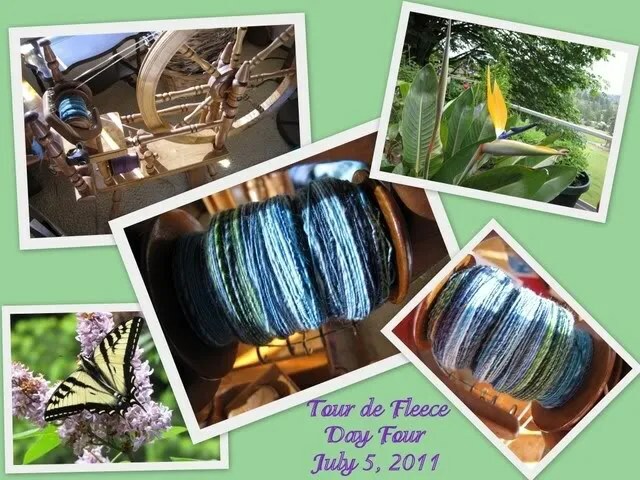 I didn’t get to have a whole lot of spinning that day, but I could still see that my bobbin is getting fuller. It’s not filling as evenly as I’d like because my flyer hooks (da flyer is the U-shaped da kine that the bobbin slips onto) are all hamajang. I went to the hardware store to get new ones, and asked my talented neighbor if he’d be able to help me with them. He couldn’t do it for a couple of days, so I just did the best I could in trying to fill the bobbin as evenly as possible, considering that a whole bunch of hooks were missing! I was so blessed that my Bird of Paradise was blooming on the very day that I needed to take some photos for the collage! And the Tiger Swallowtail Butterfly had stopped by a couple of months ago, so I added his photo to the collage too. Good for you, Moki-chan – you gotta do what you gotta do to make life (and your collage) beautiful. Nice work – steady as you go.